Peanut butter with my s’mores? Yes, Please. In cookie bar form? Abso-freaking-lutely! Between all our hiking, backpacking. camping, paddleboarding & hammock drinking adventures this summer I didn’t spend much time baking. I know, it’s shocking. Who knew I was more of an outdoors girl? It would have been a great summer for baking because the weather never got very hot so having the oven on wouldn’t have been torture. But that also mean it has been a great summer to lay in a hammock and drink wine. Soooooo. . . . . you know. When I did bake it had to be really worth it. 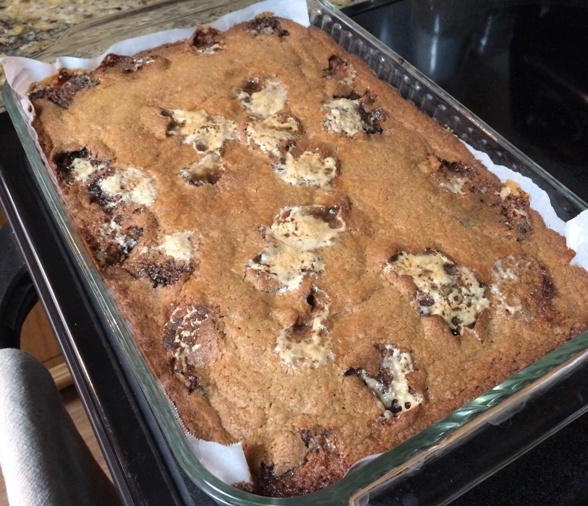 So I made these cookie bars. They are gooey and peanut buttery with a delicious graham cracker crust. My favorite crust. FYI – a smear of peanut butter on an actual s’more is also delicious. Cookie butter is good on them, too. And recently Tim got me a jar of Jif Salted Caramel Hazelnut Spread which is similar to Nutella with a salty, caramel flavor. I haven’t tried it on s’mores yet but it’s awesome on a spoon. I just really like butter/spreads. 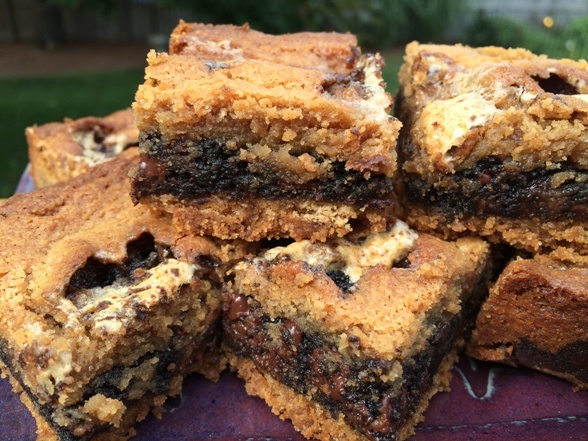 There are several layers to these cookie bars but they are all easy. The marshmallow layer that I so carefully layed out just ended up floating to the top as they baked. I though it was problematic mistake but it ended up being a happy accident! It distributed the marshmallow and made the top all gooey and delicious. Quite a marshmallow grid! I just cut full size marshmallows in half for this. You could probably cover with a layer of mini marshmallows instead. I can’t guarantee the results. 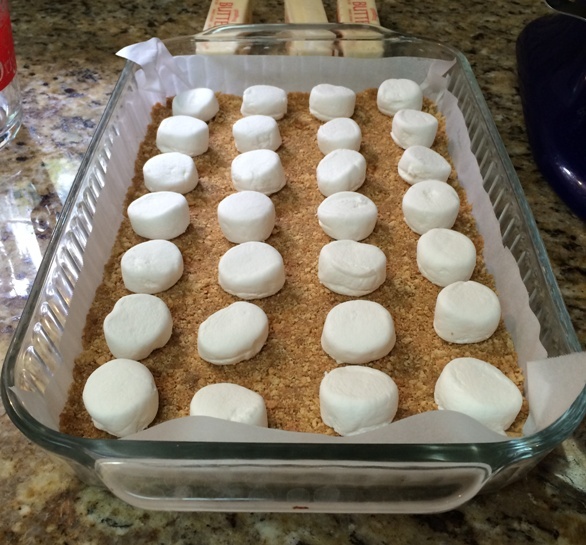 Press the graham cracker crust in first, top with the marshmallow grid and pour/spread the brownie layer around. It’ll take a little time to gently push the batter around the marshmallows and then get the peanut butter batter on top. Each layer is thin so it takes a little finessing to get them all spread around. The end result is worth it. The top layer is the peanut butter layer. It’s a bit like a peanut butter brownie batter. Be sure and line your 9×13 with some parchment so that you can easily lift the whole thing out after it cools and cut it into squares. These keep really well. They don’t dry out like some cookies/brownies do. I chalk that up to my happy marshmallow accident. And the peanut butter. I put them in an air tight container and took them camping with us. They were still gooey and delicious 6 days later when I ate the leftovers after we got home from camping. It’s fall bonfire season now (for us at least) so I’m sure I’ll be making some traditional s’mores but should you need a ready-made version to enjoy, these are the ones! Mix all ingredients together and press firmly into a lined 9×13 pan. Put butter & brown sugar in a large mixing bowl. Mix together and then add egg, vanilla, salt & milk. Stir together well. Add the flour and stir to combine. Fold in the chocolate chips. Gently pour/spread the batter over the marshmallow. Set aside and make the peanut layer. Put butter, peanut butter and brown sugar in a large mixing bowl. Mix together and add the egg and milk. Stir to combine. Add the flour and mix until the batter is well combined. Gently pour/spread the batter over the chocolate layer. Put pan in an oven preheated to 350 degrees. Bake for 45 minutes. Cool completely and them lift out using the parchment. Cut into squares with a sharp knife. Store in an airtight container. 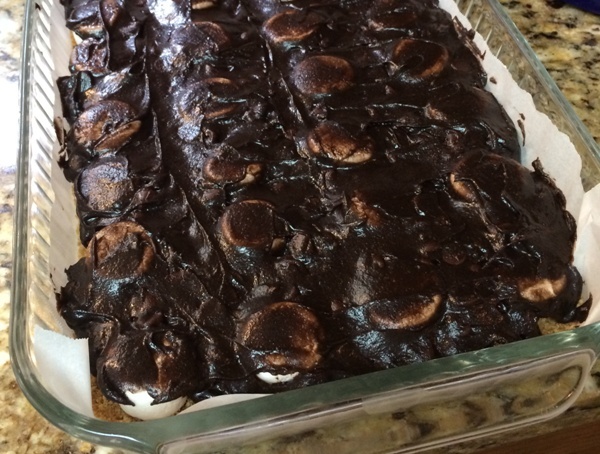 Posted in Fun Stuff, Sweet and tagged cookie bars, graham crackers, layer bars, Marshmallow, peanut butter, peanut butter smores, smores. Bookmark the permalink.